We start off the 2019 collection of photos with images from Portlaoise, Limerick Jct., Limerick and Nenagh. Pictures from Ballybrophy and Limerick. Pictures from Portlaoise as the sun was setting on 22050 as it arrived into the station, with an additional picture from Limerick after I alighted from the 1530 service from Heuston. Photos from Portlaoise, Limerick Jct. and Limerick. 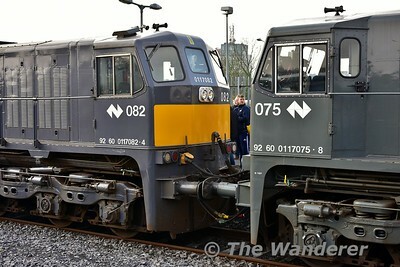 An unusual visitor to Laois Traincare Depot in the form of track recording car 700. 18 photos from a trip from Portlaoise to Dublin with images from Heuston, Connolly and the Docklands of Dublin. While waiting for my train, I noticed that platform end fencing has appeared at Portlaoise, even the disused bay platform was treated. Pictures from Portlaoise and near Thurles today, highlight being Belmond Grand Hibernian 216 working a Cork passenger diagram. While having to make a quick sortie to the Dublin Docklands on Wednesday evening, I managed to get some photos from The Point, Spencer Dock, Mayor Square and some evening time photos at Heuston Station prior to catching my train home. 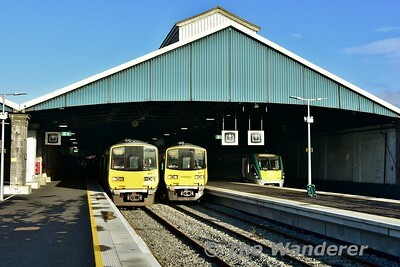 A few images from Limerick Station. Today had been long marked in for a ramble around the south and west part of the IE network, but I found myself having to make changes as a short notice trip to South Wales cropped up for the next few days. So instead of a circular trip from Limerick to Waterford - Kildare - Athenry - Ennis and Limerick I found myself heading from Nenagh at 0740 to Ballybrophy, Portlaoise, Portarlington, Clara, back to Portarlington before heading south to Portlaoise, Limerick Jct. , Limerick and Ennis, before retracing my steps to Thurles to be collected for a road trip to Rosslare (getting there by train or bus from Munster is a PITA these days). Despite some miserable weather in the Midlands which wasn't great for photos it was good to venture to parts of the network I haven't been to for a while. See the 2019 International section for pictures from a few days in South Wales. After alighting from the Stena Europe, 22053 arrived at Rosslare Europort on the 1333 from Connolly. Over the weekend of the Saturday 26th and Sunday 27th January, all Maynooth and Sligo services were diverted to operate over the Midland Great Western line via Newcomen Jct. 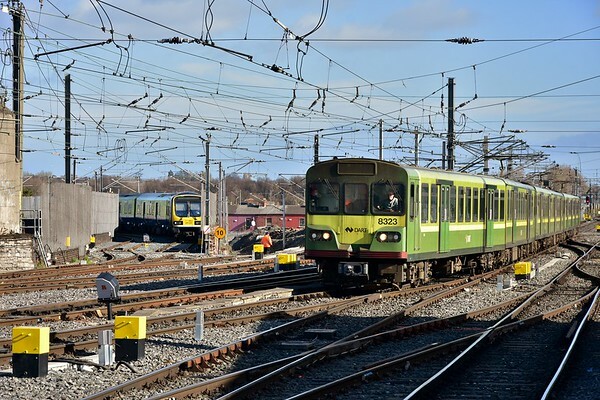 instead of the normal booked route via Drumcondra over the Great Southern and Western Line due to engineering works at Glasnevin Jct. 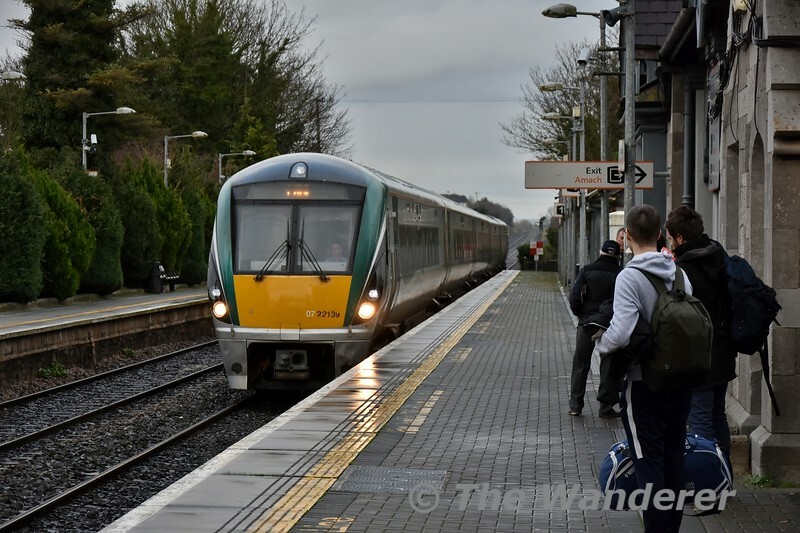 Pictures are from various locations on the Midland line in Dublin. Today's pictures come from a sunny, but cold Portlaoise. Two pictures from today at Portlaoise and Limerick. 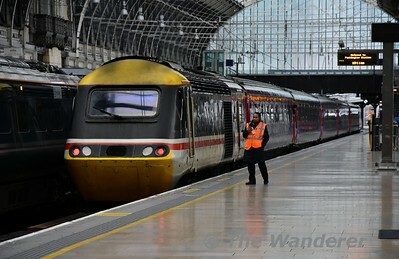 The 1400 Heuston - Cork service had the Irish President Michael D. Higgins onboard. Pictures today come from Ballybrophy and Limerick Jct.